Since the 1980’s, Matthews Wall Anchor has been offering a complete line of foundation repair products for commercial projects, including piling, underpinning, and shoring solutions. We also use steel piers for commercial businesses in the Massachusetts area. Our materials and products are made by Earth Contact Products, the leading manufacturer of underpinning, so you’re getting the best on the market. In addition, you have the services of our structural engineer on hand, to help ensure everything is up to code and the project runs smoothly from start to finish. Helical Piles: Helical piles, also known as screw piles, contain a spiral-shaped head and steel pipe extension sections. The pile is rotated deep into the ground until it reaches the desired load capacity, then connected via a bracket to the foundation walls. This allows the structural’s load to be transferred onto the pile. Augercast Piles: Augercast piles are designed to support and stabilize buildings, bridges, towers and other large structures. The auger is driven deep into the soil by using a steam auger with continuous flight. Underpinning involves transferring the load from the structure onto more suitable ground. We use vibration-free, portable hydraulic equipment that is transported to the work area. After installing and load tested the piers, the structure is restored back to normal. Plate Anchors: If your building has collapsing retaining walls, contact Matthews Wall Anchor. We offer shoring solutions for new and existing retaining walls. 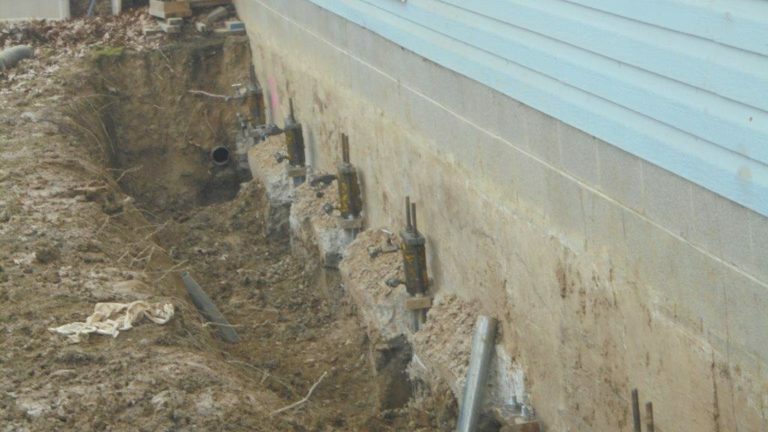 We use shoring products such as plate anchors to stabilize and support cracking and bowing foundation walls for buildings in Massachusetts. Soil Nailing: Another shoring solution is soil nailing. It can be a temporary or permanent solution used to support plants, tunnels, buildings, and other structures. Our team of experts drill holes into the soil, then install steel bars into the holes to ensure stability. Next, a drainage system is installed and the area is cleaned up. Matthews Wall Anchor is the commercial foundation repair company for businesses in the Massachusetts area. We provide free, detailed estimates so we can help you with all of your commercial needs. We use specially engineered products on today’s market. Contact us today so our contractors can assist you!